North Texas Compensation Association - NTCA June 2018 Luncheon - WorldatWork Total Rewards Year-in-Review Research & Practices: Speaker Lindsay Strack! 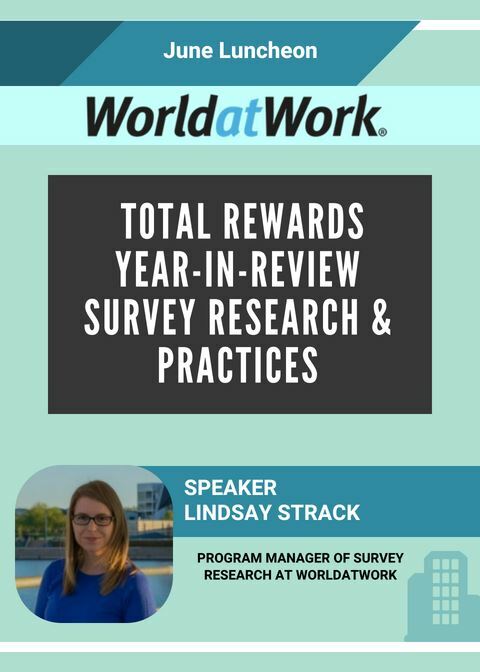 NTCA June 2018 Luncheon - WorldatWork Total Rewards Year-in-Review Research & Practices: Speaker Lindsay Strack! The Future of Work and Rewards on how rewards strategies, policies and programs are changing in response to changes in work and in the workforce like advances in technology over the next three to five years. Current performance management practices covering how organizations are rewarding for performance and how performance management may be changing in organizations. Salary history ban and the approaches organizations are taking to comply with new laws and the changing landscape of U.S. salary history bans. NTCA has immediate need to fill the role of President for 2019-2020. The position will officially begin Jan 1st 2019. NTCA is at a pivotal point where we need a successor in place as soon as possible. The President is responsible for directing NTCA strategy and presides at membership and Board of Directors meetings. This position is the official spokesperson for NTCA and guides the directors and committees in carrying out the goals and objectives for NTCA. The President handles group public relations and the ongoing solicitation of new members.